Geena Davis was in Australia last week to discuss ways to empower women and promote gender equality with UNIFEM. 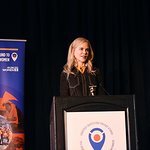 Globally, UNIFEM is partnering with Geena Davis in an effort to change the way media represents women and girls, both in terms of increasing the number of women and girls in the media and presenting them in a more positive way, and to encourage media to present and investigate issues of importance to women. During the meetings, the Australian government announced it will provide $300,000 to the UNIFEM Pacific Fund to End Violence Against Women. These funds will be used to support UNIFEM’s work in Papua New Guinea, Solomon Islands, Kiribati, and Nauru. They will enable UNIFEM to provide support to community organisations and front line workers to improve the services, such as counselling, legal and practical support and safe havens to women who are survivors of violence. It will also be used to provide small grants to organisations in Nauru.